The U-2 prototype (Article 341) as it appeared early in its career epitomized the concept of elegant simplicity. In 1954, the Lockheed "Skunk Works" began work on a top secret reconnaissance aircraft, under the codename Project AQUATONE, for the Central Intelligence Agency (CIA). Clarence "Kelly" Johnson designed the single-engine jet to carry its pilot over "denied territory," such as Russia and Cuba, while cruising at altitudes above 70,000 feet and carrying a variety of cameras and sensors. Powered by a Pratt & Whitney J75 engine, the airplane featured long, slender wings and bicycle landing gear. It was officially called the U-2. The "U" for "utility" was meant to obscure the airplane's true mission. The U-2 prototype never carried a serial number, and was referred to simply as Article 341. Johnson called it the "Angel." Due to the secrecy of the program, a secure test location was required. After a lengthy search, the CIA and Lockheed selected Groom Lake, Nevada because the dry lakebed made a perfect natural landing field. A small airbase with a 5,000-foot paved runway was constructed just off the southwest corner of the playa. It was a primitive facility in a very remote location. With wry humor, Kelly Johnson initially dubbed it "Paradise Ranch," but it was officially named Watertown. In later years it was called Area 51, a name that has come to symbolize government secrecy and exotic aircraft. Lockheed technicians completed construction of the U-2 prototype on 15 July 1955. On 25 July, Article 341 was shipped to the test site inside a C-124. Static engine runs were completed two days later. Preliminary taxi tests were conducted on 1 August. 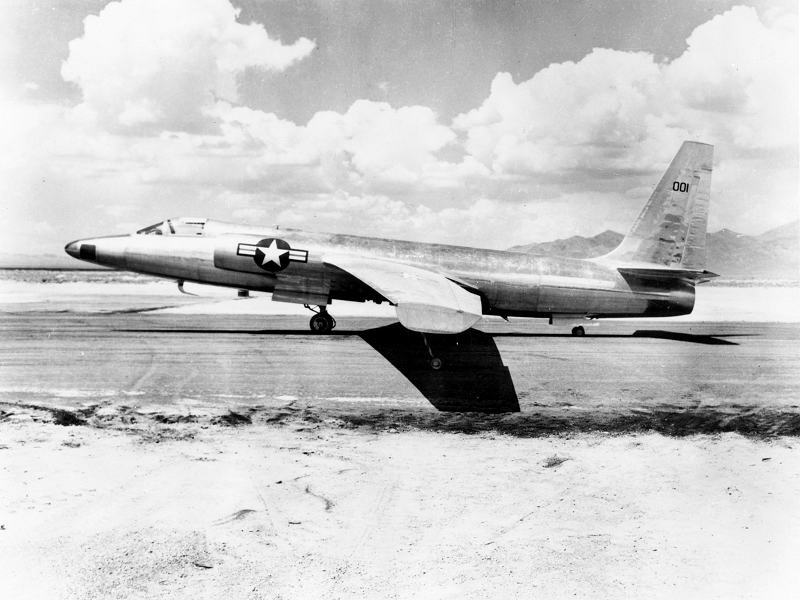 During the second taxi run (at 70 knots), Lockheed test pilot Tony LeVier noticed that the U-2 had become airborne and was about 35 feet above the lakebed. He brought it down with some difficulty, blowing the tires on the main landing gear, and setting the brakes on fire. Following additional taxi tests, LeVier made a second flight on 4 August to get a better feel for the airplane's handling qualities. "It flies like a baby buggy," he told chase pilot Bob Matye. The 20-minute flight ended with more landing difficulties. LeVier flew again on 6 August to practice his landing technique. By now, he had determined that the best approach involved landing the airplane like a tail-dragger, tail wheel first. The official first flight took place on 8 August 1955, with LeVier using the call sign ANGEL 1. Bob Matye and "Kelly" Johnson flew chase in a T-33. The flight lasted nearly an hour and reached an altitude of 32,000 feet. It ended with a low pass over the spectators, including Richard Bissell of the CIA and Col. Osmond J. Ritland. Tony LeVier went on to make 18 more flights in Article 341, completing Phase I testing. His accomplishments included taking the aircraft to 52,000 feet and a speed of Mach 0.85. After LeVier left the program, Lockheed test pilots Bob Matye and Ray Goudey took over. Robert Sieker joined the program in September 1955. Bob Schumacher followed in November. Through an intense series of flight tests, they expanded the airplanes operating envelope to its design altitude.